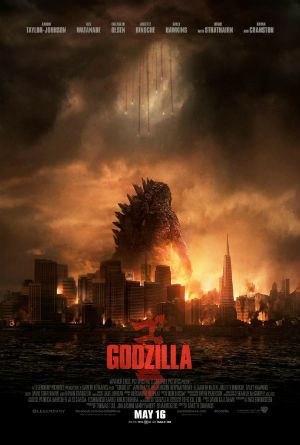 Godzilla starring Bryan Cranston,Aaron Taylor-Johnson,and Ken Watanabe,follows the story of nuclear scientists and the military as they discover,and battle a creature that unleashes a wrath of prehistoric proportions on a modern-day world. The Warner Brothers and Legendary Pictures duo outdid themselves in the apocalyptic action adventure. Monsters, and Dinosaurs Oh My!! After the accident and death of Joe Brody’s wife in a Japan Power plant,Brody sets off on a 15 year study where he learns that all the strange geological activity in Japan is actually being covered up and is something else entirely different. With the discovery of strange prehistoric creatures,a chain reaction of events leads to humanity fighting for their world. Once the terrestrial creatures are unleashed, they destroy everything in their path to mate with each other. As scientists learn that the two are communicating with another creature, the race begins as the military fights to save the world from destruction. Another creature surfaces to claim American territory. As Godzilla reeks havoc upon American soil, he is threatened by the two monstrous forces. Godzilla battles the two and defeats the creatures and claims the title King of the monsters. The story line was engaging, and every scene was directed and delivered in way that kept the movie goer interested. The destructive scenes were exciting and there was a balance of special effects and sound that united all the elements of the story. The movie had a unique tone to it that subtly paid homage to the original Godzilla. It was a remake that did the original great justice and enhanced the story further. There are talks that a Warner Bros sequel is in the works, which will make movie goers happy. This was a movie that technology embraced to the fullest but wasn’t over shadowed by it. I gave this movie 5 stars! A must see for Memorial Day Weekend!